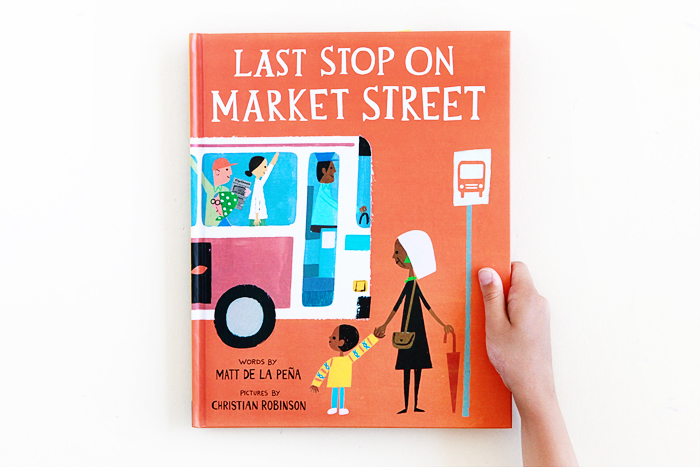 I'm trying to catch up on all the incredible children's lit published in 2015 and am finally, finally getting around to reading Last Stop on Market Street by Matt De La Peña and Christian Robinson. It’s beautiful on so many levels. And it reminds me of when I lived in San Francisco and used to take the F or J line up Market Street with my flatmate on the weekends to wherever it was that we were going. An idea struck us one day. We would ride a bus or Muni car from the beginning of the line all the way to the end, and with a tape recorder in hand, would ask people where they were going and why. We would find some revelatory common thread that would weave everyone’s narrative together. Then we would send it in to This American Life and hopefully, in our wildest dreams, they would air it on one of their shows and we’d get to hear Ira Glass introduce our segment in his endearing cadences. Well, we never got around to our audio story. Perhaps too much of our time went to studying, eating our way through the city (when we had the money), and listening to The Shins and Iron and Wine. Am I dating myself? lol Anyway, that was a big tangent, and didn't have too much to do with the beautiful story and message of Last Stop on Market Street, but I love how books evoke memories, like this one.